When it comes to writing a long work with bibliographic references, indexes, and so on, I highly recommend the use of the LaTeX typesetting system (pronounced ‘lah-tek’). Used with BibTeX (BIBliography TeX), LaTeX makes for high-quality typesetting for book-length documents in the Humanities. Dario provides a very clear visual introduction to show how LaTeX typesets a text — in other words, what LaTeX does to make a standard and ugly-looking text typed on a computer look like a real, professional-looking book which adheres to professional typesetting rules used by commercial publishers. Instead of trying to figure out what the correct indentation, spacing between words and punctuation, and so on, let LaTeX do it for you. The result is impressive. But there is more than mere good looks to LaTeX: with BibTeX, you can also use a database of bibliographic references which you can then insert in your documents. BibTeX formats the citation for you, following rules define by you. Do you need your references to follow the MLA citation guidelines? Do you need the same document to follow other citation guidelines the week after that? Instead of changing each citation style manually, BibTeX allows you to select a reference ‘style’ and then your references are automatically formatted following that style. Also, LaTeX/BibTeX keep track of the citations and format them accordingly: no more need to keep track of those op. cit. and ibid., that is automatically updated every time you typeset your document. 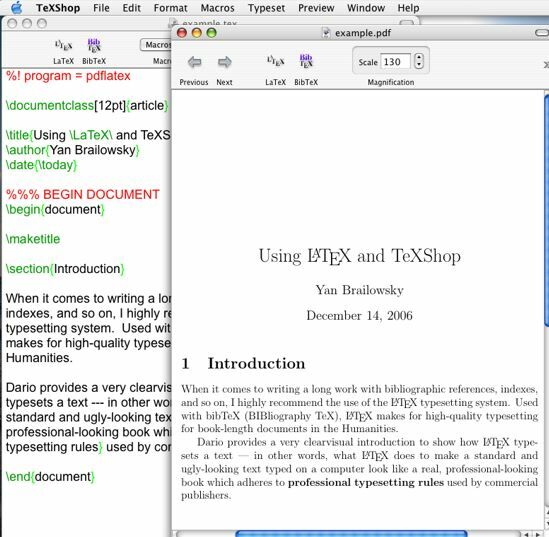 I use TeXShop and BibDesk for LaTeX and BibTeX respectively. These work for OSX and provide extensive documentation which will help you install LaTeX on your computer easily. Is LaTeX only for geeks? LaTeX can be disconcerting at first. For instance, instead of writing a text that is ‘justified’ as you write, you must proceed in two steps: first, you write your text, and then you tell LaTeX to typeset it to see what it looks like on a page. At first, it might seem bizarre because you don’t see what your text ‘looks like’ instantly as you write (with the proper margins, etc. ): you must ask LaTeX to show it to you. In this case, the mental transition from the way a typical word processor works to how LaTeX works might take you a few minutes. Also, LaTeX uses a number of weird-looking codes to signal that a word is emphasized or that a block of text is an indented quotation or that a group of words is a section title. Once you’ve understood the idea that what you’re doing is simply structuring your text and writing the command that you want, you’re out of the woods. The mental effort to switch to this kind of thinking usually takes about an hour — not of work, only that it takes time to ‘accept’ the fact that you now see what you are asking the computer to do. Not only will your document look better with LaTeX, it is also a much much more reliable way to process big documents. You will no longer have unwieldy documents that crash mysteriously, page numbering that does not tally and footnotes that disappear on the day you have to hand in your manuscript to the printer. If there is a problem with your file (for instance, you forget to say where an indented quote ends), LaTeX tells you what the problem is and how to fix it. Even though people often say that Word is WYSIWYG (What You See Is What You Get) software, I believe LaTeX is actually truer to that spirit : if you want a word emphasized — not the empty space or the comma that comes after it — you can see it with LaTeX. With Word, you might not discover this until you see a quirk in your page layout. LaTeX offers no other surprise than a superb layout. I’ve created a package (yanthese.sty) which automatically includes a number of packages and formatting rules that change the default ‘book’ template. You can install it and modify it to suit your needs. Among some of the changes that I needed to implement: quotations appear smaller in size than the rest of the text; marginal notes are also smaller in size, and more legible (this is useful while you’re drafting your thesis to put notes for yourself in the margin); modified TOC and headings style; multilinguism, etc.